Being able to communicate with one another, whatever device, whatever network, should be possible with any form of communication. However, with so many protocols & standards in the video world, and the number is growing, it is key for organisations to ensure their investment is interoperable, future proof, and they have the capability to communicate with anyone, however they choose. Many organisations with past investments in video infrastructure find themselves on a distinct island of technology – unable to communicate with the outside world, apart from others on the same island as themselves. Similarly, organisations implementing Microsoft Lync or Skype for Business, or those integrating Google Apps/G-Suite, Google Hangouts and Google Chromebox into their workstreams may find themselves unable to communicate with guests or other organisations, and unfortunately will often only find out the problems this can cause once the large investment has been made. On average, organisations are juggling 4.4 different communication platforms across their organisation, and 65% of companies use multiple collaboration solutions. VideoCentric’s aim is to enable teams to come together. Our core values lie within multi-vendor interoperability – see our manufacturers & partner page to find out more – so we don’t focus on any one specific technology or solution, we focus on the solutions that enable the best experience and ensure connectivity between all. Within our interoperability testing suite – the most comprehensive suite in the UK – we stringently test each product & solution for interoperability challenges, and work with manufacturers and our service/product development team to ensure these islands can seamlessly connect. Get in touch with the VideoCentric team today to discuss your interoperability challenges, and find out ways in which we can help you join your islands of technology together. 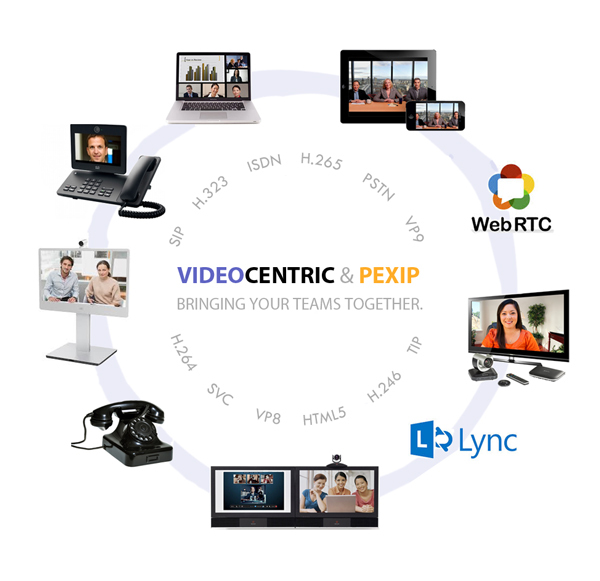 Pexip Infinity enables you to connect your professional video conferencing systems to Microsoft Lync, Skype for Business, web browsers, tablets and smartphones, audio conferences, and much more. Pexip Infinity brings every video conferencing system and solution together, seamlessly, effectively connecting anything to anything, regardless of device. Infinity automatically connects and transcodes any legacy and current codec, such as H.323, SIP, H.263, H.264 SVC, RTV, VP8 or RDP, and supports outbound streaming through RTMP enabling recording, streaming and on-demand playback of your video meetings. Plus, Pexip Infinity closely integrates with WebRTC-supporting browsers like Google Chrome, Mozilla Firefox and Opera as well, so that users without any other tool than their web browser can join the same meetings as everyone else. And for non-WebRTC supporting browsers like Microsoft Internet Explorer and Apple Safari, Pexip supports video conferencing though Flash-based video. Flash is already installed for most users, allowing them to enjoy video calls with no additional downloads as well. Pexip Infinity provides the backbone to the VideoCloud service, so that any organisation can have the benefits of Pexip Infinity whether deployed on-premise, in the cloud or as a hybrid solution. Many organisations, especially those focused on secure networks, are using ISDN for their video communications. 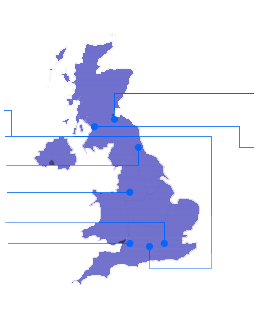 Organisations such as the NHS, the courts, prisons & blue light services, and financially regulated organisations generally use ISDN video conferencing systems and ISDN lines to gain access to the outside world. Additionally, many developing countries, or businesses located remotely, may be using ISDN as it is their only choice! Find out more about Video Conferencing Standards in this Tandberg/Cisco Whitepaper. For more information on our ISDN solutions, or how you can integrate video into your network, contact our team today. Many organisations are implementing Microsoft Skype for Business/Office 365 as their primary form of communications within their business. Microsoft Skype for Business can include HD video at the desktop, however interoperability between Microsoft Skype for Business and the rest of the world is a huge concern for IT managers and business owners – this island is causing organisations to be silo’ed after a major investment in their communications. VideoCentric have a full portfolio of solutions for Microsoft environments, whether this is for connecting Skype for Business to the rest of the video world or integrating Microsoft Office 365 with other Unified Communications platforms such as Cisco Spark or Google G-Suite. Find out more by visiting our dedicated Microsoft Skype for Business solutions or getting in touch today. Whether you have a mixed vendor environment of Cisco & Polycom Infrastructure, are looking to combine you Microsoft Skype for Business platform with your Avaya platform, or you have a specific requirement that not one single vendor can provide, speak to our team today, who can help you look at the options available and provide a multivendor offering that meets your requirements and more. VideoCentric’s expertise lies in Video Conferencing and Video Collaboration Solution multivendor integration and interoperability solutions. Speak to us today. Many of our biggest customers have multivendor solutions in place – take a look at our case studies and find out more!